RaceDeck Garage Floors and My Classic Car announce partnership for the “Coolest Garage On TV" contest taking place now through October 14th, 2019. 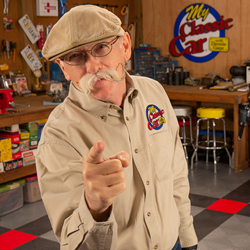 RaceDeck and television host Dennis Gage want YOUR garage to star in a segment of the hit show My Classic Car. RaceDeck Garage Floors and the hit TV show My Classic Car have announced the first ever ‘Coolest Garage on TV’ contest. Eligible participants with a RaceDeck Garage Floor and one (or many) cool cars are encouraged to enter, with the grand prize winner and garage being featured on an episode of My Classic Car. Host of the popular car show, Dennis Gage, and his crew will be travelling to personally tour and film the winning garage for a segment to air in 2020. Contest entries, comprised of a description of the garage, photos and/or video, can be submitted until October 14th, 2019 at racedeck.com/my-classic-car/. The grand prize winner will be announced via Facebook live at the 2019 SEMA show in Las Vegas. Both the RaceDeck and My Classic Car crews can’t wait to see some incredible garages. "Over the last 20+ years we have seen so many amazing garages from our RaceDeck customers and now we are excited to have one of them featured on the longest running hit car show ‘My Classic Car’ with Dennis Gage. We can’t wait to see all of the cool rides and cool garages that will be submitted for this 1st of it’s kind contest," said Jorgen Moller, RaceDeck CEO. The team at RaceDeck have been engineering and manufacturing industry leading garage floors for over two decades. The RaceDeck product line up offers a variety of patented designs, colors, and finishes. From classic diamond plate, to traditional coin, to the virtually maintenance free Free-Flow, RaceDeck garage floors are easy to install, durable, and engineered for any garage (commercial or residential) anywhere. With over 29 patents and counting, RaceDeck offers the most advanced garage flooring systems in the world. Based in Salt Lake City, Utah – RaceDeck floors are proudly Made in the USA. My Classic Car, currently in its 23rd season, is a popular series following host Dennis Gage to view major classic automobile shows and collections. The show, currently airing on MotorTrend, has become a viewer favorite for all things automotive. From car collections to local cruise-ins, to dailydrivers, Dennis and his crew have you covered. RaceDeck has been a proud partner of My Classic Car for over ten years.